This post is going to be something different. What I’ve tried and, with varying degrees of success, managed to do is create my best shot of fan-fiction for Season 8. No, I haven’t literally written it out episode by episode, line by line; instead, it’s my predictions for how the next season is going to play out, combining a number of theories and projections. Of course, the further away from the start of the season we go, the more uncertainty there is – by the time we reach Phase 3 in this post, it’s pretty me just making it up as we go. This post is basically split in four mini-parts. In Phase 0, I lay out where all the characters are as of the last episode of Season 7. Then in Phase 1, we look at the immediate, short term ramifications of everything that is pending resolution. Phases 2 and 3 then explores the consequences of those actions and so on. I’ve tried to limit myself to just the more likely or interesting possibilities or I would otherwise never have got this post out at all. Having said that, there’s a lot of moving pieces here so there might be a few errors in initial bits or some obvious possibilities that I might have overlooked – any help in pointing them out would be very much appreciated. North: The wall has fallen. The fate of Tormund and Beric are currently unknown. The Others are advancing southward, but their destination is unknown. Winterfell: Bran, Sansa and Arya, having disposed of Littlefinger, are in Winterfell, with the force of the North, such as they are, with them. The Knights of the Value are present as well, pledged to Sansa. Sam is in Winterfell for the moment too. 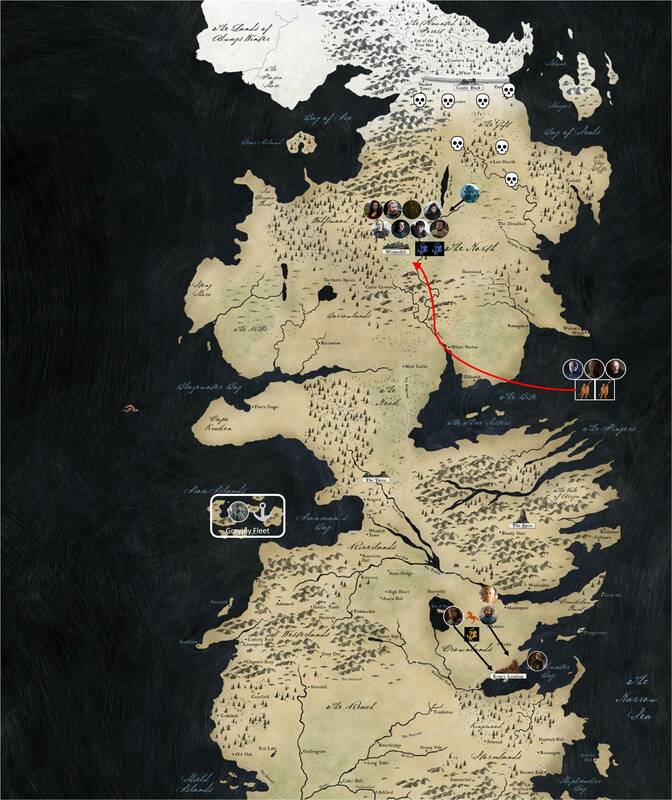 The Narrow Sea: in a ship somewhere, Dany, Jon and Tyrion are trucking along, heading for White Harbour to introduce Dany to the North and the North to their new queen. Also somewhere in the narrow sea, Euron, presumably with Yara in the hold, and the Greyjoy fleet, is sailing along. Where is he headed? How about Theon – how is he going rescue Yara if he doesn’t know where she is? what do the Others want? What is their end goal? Where is Euron headed? Is he going back to Pyke like he said, or has Cersei given him specific instructions – for example, shipping the Golden Company over to Westeros. Where is Theon going? How is he going to get there? What’s his plan, exactly? This is what I’d expect things to look like by the opening episode of Season 8. 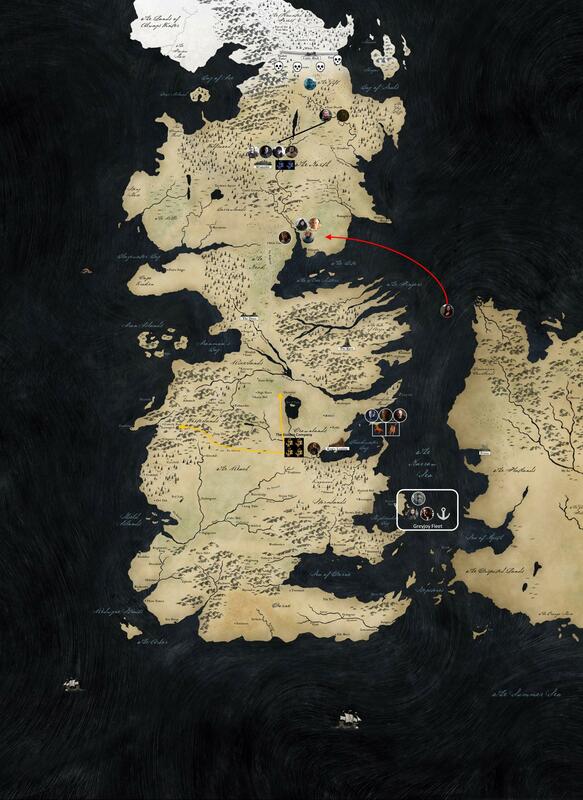 White Harbor: Jon, Dany and Tyrion will land and begin with whatever their reason was for going there. I’m sure we will get some token drama about how some Northern Lord no one has even heard of before opposes Dany as Queen, and we’ll see Dany display a more understanding side as she lets slide an offence that she once burned a man for. If Tyrion knows about Jon’s parentage, I think he will reveal it at this point, which could lead to further drama. Depend on where the story is going with Jaime, the group could meet Jaime at White Harbor or thereabouts; they will need to make a decision about what to do with Jaime and how to deal with the threat that Cersei poses. I theorize that Dany will redirect her army and one dragon – likely Drogon and the Dothraki – to deal with Cersei and the Golden Company. I’m aware that timelines are already not really making sense but that’s never stopped us before. Dragonstone: I don’t really see the Dragonstone cast playing a big role in this this phase. Perhaps, Melisandre will appear, looking for Dany but I rather think that she will go to White Harbor and meet both Dany and Jon. King’s Landing: The Golden Company arrives and Cersei begins to assert control over the territories that she’s lost. Rather than go South, she probably heads North, aiming for Casterly Rock, Harrenhal or even Riverrun. The main reason I think this is going to happen is because the series need to establish that Cersei and her armies are an active threat to Dany. They need to do this in order to ensure that the audience understands why Dany has to deal with Cersei now rather than after tackling the Others. North: Last Hearth has fallen, now it is Winterfell that’s under threat. We’ve got most of the North’s firepower accumulated in Winterfell – Northern forces (what’s left of them) plus the Knights of the Vale and the Wildlings with Tormund and Beric. The Night King is approaching with his army and Viserion. Jon and Rhaegal might be involved as well, as might Melisandre. I can see a fight for Winterfell being a key moment in the first half of Season 8 – basically, it’s what the Allied forces think is necessary to beat the enemy but when they do lose, it’s a huge blow and puts them on the extreme defensive. I think we might lose some characters here – Beric, would be a prime suspect, fighting a horde just to give the other characters a chance to retreat. Alternatively, Winterfell is besieged and a few characters make it out to get help but the rest are trapped, perhaps in the crypts or some other key location. Reinforcements are en-route; the Unsullied and Dany’s forces apart from the Dothraki are on their way. We might get a Helm’s Deep kind of situation where these forces save Winterfell at the last minute and by enough time for the heroes to fall back. The key thing here is the Others may face a small setback but it should not be enough to lower the danger they pose as an enemy. King’s Landing: I think at this point we also see a big fight in the South as the King’s Landing storyline comes to a head. The Golden company clash with the Dothraki; I think Dany, Jaime and Tyrion are with them. The Golden Company is defeated and Jaime and Tyrion ride ahead to take Cersei. Perhaps someone loses a dragon at this stage; I think we’ve seen too much of Cersei’s dear scorpion for it to be totally useless. I don’t see Cersei surviving this – perhaps we lose Jaime here as well. If the Dothraki do survive, I don’t think it will be many of them; if not it gives the audience a lot of hope that Allied forces still have a chance. Pyke: It’s really hard to predict what Theon and his gang will be up to at this point. I’ve sort just given. We can think of them as some kind of wildcard that could swing some key battle in one direction – either in the North they provide some kind of relief, though that’s unlikely or in the South they help blockade King’s Landing. Lot fewer heads on the board now, but this is also the last graphic because after this I have genuinely no idea how things are going to evolve. There’s no point dividing this into sections anymore. If Winterfell truly falls, I don’t know where the heroes gather next. It could be Riverrun (though if the rivers freeze, it’s not great defensively), it could be Harrenhal (but will they have the manpower to guard it) or it could be King’s Landing where Dany’s finally becoming Queen. Either way, they realize that the situation is dire; the Others have taken some large population centers and their size is only going to grow from there. Depending on how many dragons are around, Dany will have to be very careful in how to deploy them. It seems like only Drogon can take on Viserion reliably but that is simply too high a risk – and so Jon comes up with a plan to assassinate the Night’s King somehow. Maybe Sam and Bran tell him of a secret weakness deep in the heart of winter or maybe Melisandre realizes there is a way to kill the Night King without doing so physically. Jon and his band of heroes depart, perhaps including Theon as well, and thus the story goes. He says the day at the last minute, but dies, the rest either die or live to tell the tale. Westeros begins its long road to recovery, we get our political reforms (because that’s clearly what’s most important here) and Jon’s hailed as a hero till the end of time. Roll credits. In all this, I think the idea of fire consuming and ice preserving is important to remember. Both fire and ice in this series have shown the ability to restore life but imperfectly; the Others can restore life more reliably than the Red Priests and in a form that is hardier, but then the person loses their agency in the process. The Red Priests’ magic can restore life but not without consequence and not without sacrifice, it would seem. Something of the person is lost, each time; perhaps in the form of life force or personality. The thing I want to see revealed at the end of all this is just what the title, A Song of Ice and Fire is actually referring to; I know one interpretation is the whole Jon and Dany thing but I wonder if there’s something more to it. I guess we’ll have to wait and see. Do you think Winterfell is going to fall? Do you think Jon lives? Do you think Dany lives? Do you think King’s Landing is going to fall? Are they going to Wrath of the Lich King this, and have Jon become the new Night King? Alright, that’s a wrap! Ok, so quick update on what’s coming up on the horizon. I have exactly three books that I need to review – Never Let Me Go by Kazuo Ishiguro Pride and Prejudice by Jane Austen and Hyperion by Dan Simmons. All three of those will be out by this week and then, it’ll be on to Fullmetal Alchemist: Brotherhood. FMA is going to be done in a series of 6-8 episode bursts (I want to be flexible with it because in longer running shows I don’t want to stop mid-way through an arc) but I’m hoping to kick that project off next weekend. I could see them taking Cersei’s scorpion and making some dragonglass projectiles to try and shoot down the zombie dragon with, but if they have the budget I’m sure they’ll want a dragon on dragon fight just for the spectacle. I’m curious about Theon’s plans next season. If Yara is in Cersei’s dungeons instead of locked up on one of Euron’s ships, then rescuing her is going to be a lot more complicated. She seems like she’s more Euron’s prisoner that Cersei’s though, so I expect this to come to some kind of head on a ship or in the sea. Maybe Theon will drown Euron? That might be fitting. I could see Theon managing to rescue his sister, then being confronted by Euron and some of his men. Then, in the ensuing fight, maybe Theon takes Euron over the edge of the boat and tries to drag him down to the depths with him. Could be a good note for Theon to go out on, or Yara could rescue him at the last minute. Give him the ol’ Drowned God baptism treatment. Theon reborn or whatever. I dunno. I think Theon’s got some redemption coming, but whether he lives through it is another question. And I’m honestly not sure how any of the fight with Cersei or the invasion of the Others is going to turn out. Pretty sure they’re going to give us Clegane bowl and that someone’s gonna kill Cersei. I’d like it to be Jaime, because at this point Arya doing it seems kind of empty. I feel like that ship sailed when she decided to come home to Winterfell instead of going to King’s Landing. I think Jamie killing Cersei is probably the only thing that’ll feel satisfying at this point.